Earlier this summer I was contacted by Rachel Turiel, who had just finished reading my book, Preemie. 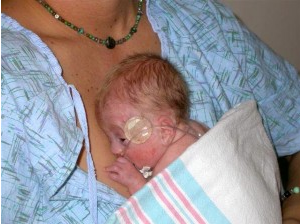 Her baby was born at 25 weeks, just like my Andie. He weighed in just an ounce more, at 1 pound 12 ounces. His name is Col, which as Rachel says, rhymes with soul. I was curious and after just a few minutes on her site, I was entranced. Immediately I knew that this was a blog I would visit frequently. Then, to save myself the trouble, I entered my email in the subscribe box in the sidebar, and now every week, Rachel’s latests musings on her own journey in love, life and motherhood (and unlike mine, her illustrious gardens) arrive in my email inbox. I’ll leave you curious, too, and let you follow this link to read our interview and discover where it is that Rachel writes at 6,512 feet. Can you guess? Leave a comment on Rachel’s post before December 10th and enter for a chance to win a free copy of Preemie! 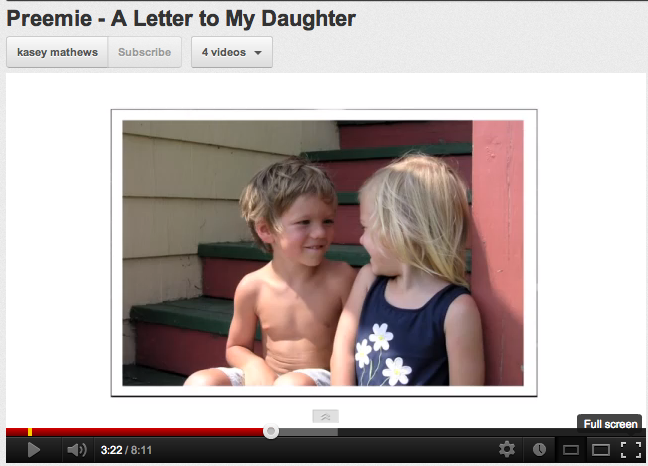 Also, if you haven’t yet seen my newly released video “Preemie – A Letter to My Daughter” please check it out! Response so far has been tremendous, and I’m so grateful to everyone who helped make the video a reality. If you’re inspired by what you see, please take a moment to share it with your friends and family. You can either copy and paste this link http://tinyurl.com/Preemie-video in an email or on your Facebook page. There is also a share button right below the video on Youtube. May your coming week bring much joy and peace.